Read the how and why about this list from the top of the #10 post, then come back to read about Kuhn Rikon Kochblume Spill Stopper. Kuhn Rikon Kochblume Spill Stopper – Kochblume is German for “cook flower”, which is at the heart of the design of this unique pot-topper that can prevent boil-over spills. I rarely boil without it! When atop a pot with plain water inside, gather vegetables around the center, place a pot or pan lid just large enough to cover the veggies, crank up the heat to boil and steam the veggies. With the flower removed, turn over Spill Stopper and use it as a splatter guard. 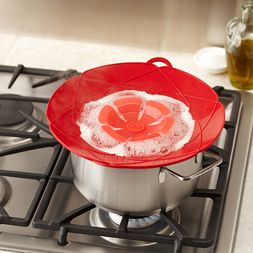 Spill Stopper is made of inert, heavy, dishwasher safe silicone, heat resistant to 400º. I used to be concerned about boil over and often found my attention distracted long enough for the mess to occur. That was such a disappointment. Now, I relax a lot more while cooking, using this simple and effective essential household gadget. In red, green and purple, priced from about $25 for the 10-inch product to about $35 for the 13-inch Spill Stopper. More information is at Kuhn Rikon. Available through these retailers online and from many local specialty cooking stores, ask for it or search for it online. Try searching on all or some: “spill stopper 13 inch”, “spill stopper 12 inch”, “spill stopper 11.5 inch”. Also try including “kuhn rikon” in your searches. It will have been worth the effort.